Twenty-six year old IM Darwin Laylo got himself a seat in the Philippine team to the 2006 Turin Olympiad (to start on the 20th of this month) by topping the 2006 National Chess Open Championship held in the Marketplace Shopping Mall in Mandaluyong City with a score of 10.5/13. The attentive BW reader might recall that Darwin first became national champion two years ago which in turn qualified him for his maiden appearance as a member of our national squad to the 2004 Calvia de Mallorca Olympiad. This year three Olympiad slots were up for grabs in this national championship. FM Oliver Dimakiling defeated IM Richard Bitoon in the last round to finish solo second with 10.0/13. There was a multiple tie for the 3rd and last seat between FM Wesley So (the 12-year old sensation), IM Petronio Roca, and National Masters John Paul Gomez, Roderick Nava, Rolando Nolte, and veteran Mirabeau Maga. A double round-robin elimination event was held after the Holy Week in Tagaytay and So, by scoring 2 wins and 3 draws, made chess history by becoming the youngest ever player to represent our country in a chess Olympiad. The three qualifiers IM Darwin Laylo, FM Oliver Dimakiling and FM Wesley So will join the seeded GMs Mark Paragua, Eugene Torre and Joey Antonio in Turin for the Olympiad. Today we will introduce Darwin Laylo to our readers. Oliver and Wesley will be discussed on Friday. Darwin was born to a poor family in San Roque, Marikina. His father was a tricycle driver and there was not much to do at home until one day his uncle brought a chess set and taught him the moves. It soon became apparent that Darwin and the game were a magical match, and pretty soon he was defeating everyone in sight. I first heard about him in 1993. 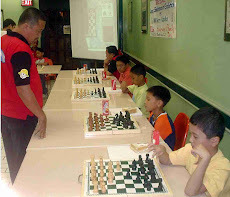 GM Joey Antonio had just gotten his International Grandmaster title and was invited to play in a giant Quezon City Open. He won it all right but had to endure an upset loss to a 13-year old in an exciting game. 1.d4 Nf6 2.c4 e6 3.Nc3 Bb4 4.Qc2 c5 5.dxc5 0–0 6.Nf3 Na6 7.a3 Bxc3+ 8.Qxc3 Nxc5 9.Bg5 Nce4 10.Bxf6 Nxf6 11.e3 b6 12.Be2 Bb7 13.0–0 Rc8 14.Rfd1 Qc7 15.Rac1 Rfd8 16.Nd4 Qb8 17.b4 d5 18.Qb3 dxc4 19.Bxc4 Ng4! White wants to sacrifice a piece on e6, but Joey counters against h2. A trap. 20...Qe5 might be even stronger but GM Joey was playing a kid who must might be enticed to sacrifice unsoundly with 21.Nxe6? when 21...Rxd1! wins the bishop on c4. 21.Be2 Qa8 22.Rxc8 Rxc8 23.Nxe6! Bh1? Naturally Black cannot play 23...fxe6 24.Qxe6+ Nf7 25.Rd7 Rf8 26.Bc4, but the correct response would have been 23...Nf3+! 24.Bxf3 Bxf3 and both white's rook on d1 and knight on e6 are hanging. Darwin finished 10th in the tournament and defeated several of our top players in the process - aside from GM Joey there was also Bong Villamayor and Luis Chiong – not bad for an unknown 13-year old. Shortly after this brilliant performance he was recruited by NM Bong Cunanan into the San Sebastian chess team. This was one of the best moves that Bong ever made, for Laylo teamed up with Ronald Dableo to establish the San Sebastian dynasty in NCAA chess. 1.e4 c5 2.Nf3 e6 3.d3 Nc6 4.g3 d5 5.Nbd2 Nge7 6.Bg2 g6 7.0–0 Bg7 8.Re1 Qc7 9.exd5 exd5 10.d4 cxd4 11.Nb3 Bg4 12.Bf4 Qd7 13.Nc5 Qc8 14.Bd6 Bf6 15.Qd2 0–0 16.Qf4 Qf5 17.Nxb7 g5?! 18.Qxf5 Bxf5 19.Ne5 Bxc2 20.Nd7 Kg7 21.Nxf6? Too much subtlety - he should have simply taken the rook with 21.Nxf8. Next stop was the Asian Junior Championships to be held a few months later in Vung Tau, Vietnam. Bong Cunanan took Darwin to the Philippine Chess Society and asked for help in his training. He did not want the business-as-usual “training” prevalent in these times where you get some money from the Sports Commission for training in Baguio, and then spend your time there eating strawberries and flirting with girls. 1.d4 Nf6 2.c4 g6 3.Nc3 Bg7 4.g3 0–0 5.Bg2 d6 6.e4 c5 7.d5 e6 8.Nge2 exd5 9.cxd5 Re8 10.a4 Na6 11.0–0 Nb4 12.h3 a6 13.f4 Nd7 14.g4 c4 15.Be3 Qa5 16.g5 Nc5 17.Bd4 Nbd3 18.Bxg7 Kxg7 19.f5 Nb3 20.Ng3 Ne5? A mistake. 20...Qb6+ followed by 21...Nxa1 wins material. When the time came for the Junior tournament Darwin was in fighting shape – he started off in the first round by upsetting the heavy favorite to win, China’s Liang Chong. This is no mean feat – Liang had represented China in the 1999 World Championship and had even won their zonal championship. Liang Chong was not able to recover from this loss. All throughout the tournament it was Darwin, Malaysia’s Hafizulhelmi Mas and India’s Krishnan Sasikiran (now a super GM) who fought for the lead. Even Iran’s highly-touted Ehsan Ghaem Maghami (now also a super GM) could not catch up with the scorching pace and was a non-factor. Although Laylo lost to both his co-leaders he defeated everybody else and his do-or-die stance greatly impressed the public. At the end he became Vice Junior Champion of Asia by finishing solo second to Sasikiran. When he came home to the Philippines Darwin had arrived, both literally and figuratively – he was already considered among the top players in the country. And that is where we have to cut this story of his early years up to the time he became an international campaigner. A few years ago during a training session I noted to Darwin that his Black openings were not impressive, and suggested a switch to more open positions with the Scandinavian. I then handed him my “secret weapon”, a CD containing secret analyses prepared over several years on the Scandinavian including a complete repertoire against White’s possible replies. This also included every known/existing game on the Scandinavian in chess history with all games catalogued per variation. Darwin took this up quite seriously and is now probably the country’s greatest expert on the Scandinavian. And this is where I will end the Darwin Laylo story, with his latest Scandinavian conquest in the tournament just concluded. It looks like White is doing fine, with an extra pawn and a strong center. In reality he has to be very careful in order to survive into the middlegame. Now Milagring realized the gravity of his situation and thought for a long time here. At the end he just decides to give up a pawn without, however, improving his prospects. Only on the 7th move, and White is already critical. White has to be careful here otherwise he will be mated. 29.Nxe1 Rb5 30.Ra1 Be6 31.Ra3 Rb1 32.Kd2 Rb2+ 33.Nc2 Bf5 34.Rc3 Bd3 35.Kc1 Rb8 36.Na3 Rb4 37.Nc2 Ra4 38.Ne1 Ra1+ 39.Kd2 Ra2+ 40.Nc2 f5 41.Kc1 f4 42.Kb1? The pressure was too much - White crumbles. "This article first appeared in Bobby Ang's column in Businessworld (Philippines) on 01 May 2006"